Mother’s Day is fast approaching, and although it feels like it gets more difficult each year to find the perfect gift, you can never go wrong with a pampering spa day. We’ve rounded up the best Mother’s Day spa specials in Johannesburg to spoil mom. The Renaissance Spa at the Michelangelo Towers in Sandton is the very definition of luxury – and with their great Mother’s Day specials, there’s no excuse not to indulge. Depending on the value of the voucher you buy, you’ll get a free treatment, ranging from a mani to a massage. Click here to find out more about the Renaissance Spa’s Mother’s Day specials. Camelot Spa at Melrose Arch is a tranquil oasis in the heart of Joburg. Book your mom in for a special Mother’s Day retreat that includes a salt exfoliation, a deluxe pedicure and manicure and an anti-ageing facial plus a delicious lunch for only R2100. We feel more relaxed already just thinking about it! Treat your mom to a facial, brow shape and tint, plus a neck massage and a mani or pedi – all for just R590 – when you book the “Pimp my Queen” package at Placecol Skin Care Clinic in Kyalami. That’s the kind of deal that only comes around once a year. Perhaps you would like to help a mom-to-be celebrate Mother’s Day a little earlier. 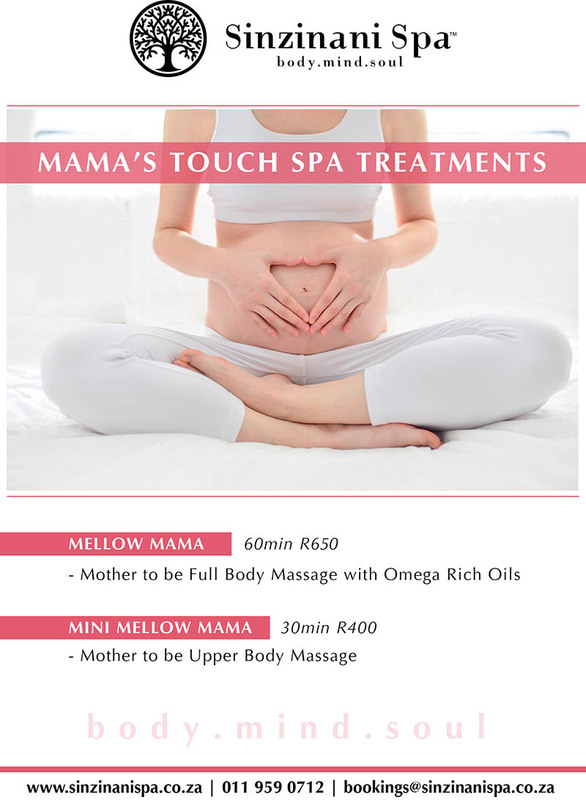 Sinzinani Spa has a wonderful package for moms-to-be called Mama’s Touch which includes a full body massage for only R650. You can also spoil your mom with their Mother’s Day Treat package only R750. Skin Sense Day Spa provides pampering and relaxation in their Bali-inspired building. Treat mom to their Mother’s Day special for only for only R1340 or their May Special where you’ll pay only R1300 for a voucher to the value of R1560 plus a Kalahari gift worth R300. Kalahari product only uses superior plant oils and phyto-effective extracts are compounded into quality skincare solutions that restore and nourish your skin. Kalahari Lifestyle is an original brand that combines innovative phyto compounding with phyto cosmetology for an authentic African botanical experience. For more information contact us on 011 807 6281 or email [email protected] or visit our website: www.skinsense.co.za #Kalahari #Special #GiftVoucher #HairSalon #SkinCare #Facial #Massages #DaySpa #Tanning #Waxing #PermanentMakeUp #PDT #Manicure #Pedicure. Spoil your spouse and daughter this Mother’s Day with a fun spa day with Country Bliss, where they’ll be treated to a full body massage, facials, head massages and gifts for only R2720. They’ll get to enjoy the beautiful and tranquil scenery of the Aloe Ridge Conservancy and spend some quality time together. Spoil mom with a day of relaxation on the banks of the Hennops River. For just R695, she’ll get a full body massage, foot massage, head and shoulder massage, plus breakfast or lunch and a complimentary gift, all in a tranquil setting. They also have full day specials for even more pampering. Click here to find out more about the Vusalela Day Spa’s Mother’s Day specials. 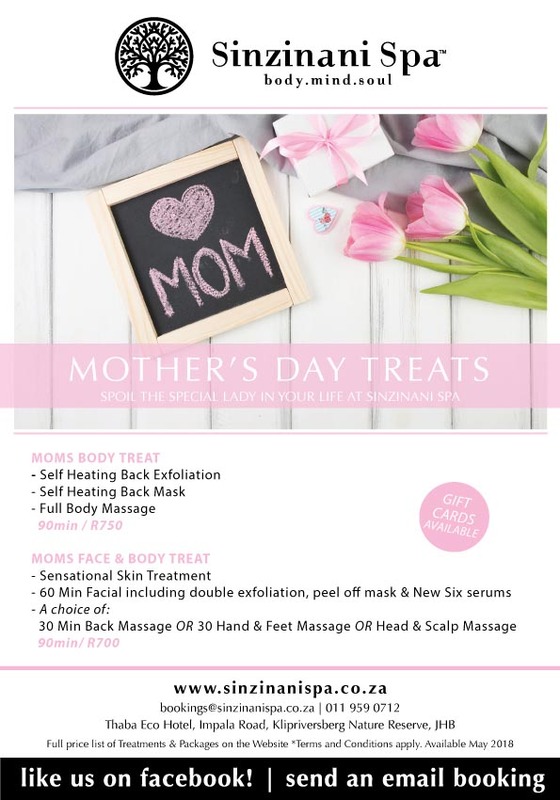 If you haven’t found what you’re looking for in our collection of Mother’s Day Spa specials, you need to visit the Health Spas’ website! They’ve got all the best spa specials in one spot. Health Spas is South Africa’s premier spas website not only because it has more than 300 spas listed, but because you can use a Health Spas voucher any time during the next three years, and they come in a variety of denominations and designs. The perfect gift for a special mom – or yourself!